Every weekend, I host a feature called Kid Konnection -- a regular weekly feature about anything related to children's books. This week I'm going to share with you a hilarious picture book that's a twist on a classic fairy tale! Summary: Hansel and Gretel will not listen to their storyteller. For one thing, who leaves a trail of bread crumbs lying around, when there are people starving? Not Hansel, that’s for sure! And that sweet old lady who lives in a house made of cookies and candy? There’s no way she’s an evil witch! As for Gretel, well, she’s about to set the record straight—after all, who says the story can’t be called Gretel and Hansel? It’s time for these wacky siblings to take their fairy tale into their own hands. So sit back and enjoy the gingerbread! 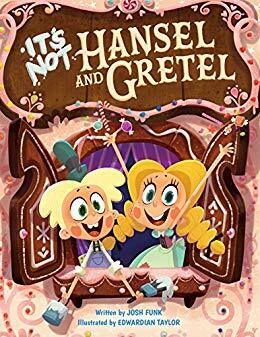 IT'S NOT HANSEL AND GRETEL by Josh Funk and illustrated by Edwardian Taylor is an addition to Mr. Funk's "It's Not a Fairy Tale" series. It's just as cute as the first one, IT'S NOT JACK AND THE BEANSTALK; and kids and parents alike will find this picture book to be extremely funny! I absolutely love these books! 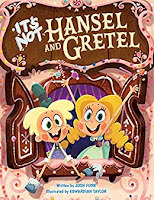 IT'S NOT HANSEL AND GRETEL is laugh out loud funny. Fans of Hansel and Gretel will see the classic fairy tale story in this book, but the smart-aleck narrator adds a whole twist to this story. He tries to keep the story on track but Hansel and Gretel definitely have minds of their own. There is lots of silliness and bickering between the characters, and it makes for one very cute bedtime read! In addition to this very funny story, the illustrations are absolutely adorable! The children with their bright eyes are perfect for this adventure, and the colorful pages with the candy are too cute. The endpapers are even gorgeous with the assortment of cakes, pies, and candy. Even the cover has glitter accents! I can't get enough of Josh Funk's books. IT'S NOT HANSEL AND GRETEL is guaranteed to be a favorite among kids (and parents too!) Highly recommended! Oh, kids love smart aleck narrators so this should be a hit! Oh, I love fairy tale retellings. I'm anxious to read this one!